Šaašaakayolia Kiilhswa ‘Grass Burning Moon’ is named for the specific way fires burn during this time of the year. At the end of niipinwi ‘summer,’ we move through the transition of teekwaaki ‘fall’ and into pipoonwi ‘winter.’ It’s during this time that the forest understory and prairie grasses start to dry out. Generations ago, Myaamia people intentionally lit fires during this time of year. Fire cleared out the brush and brambles in the forests and helped maintain healthy grasses on the prairies. One benefit of these intentional fires was to create habitats that were favorable to big game, like moohswa ‘White-tailed deer,’ miihšiwia ‘Eastern American elk,’ and lenaswa ‘bison.’ During this month, there is still enough moisture retained in the plant material that fires are of low intensity. 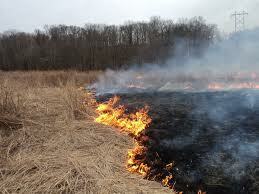 These fires mostly smolder and burn in streaky patches. Indigenous peoples across North American used fire as a tool to shape their environment. Indigenous fire created environments that felt like parks to the first European settlers, but they failed to realize that these environments were in part created through human management. As settlement progressed and the use of fire declined, the understory began to choke out the open spaces in the forests and the dead wood began to accumulate on the forest floor. Many forest management experts believe that the big fires we currently see in the west are the product of over 100 years of human neglect. Once indigenous fire was removed from the ecosystem it disrupted a delicate balance that had existed for 1000s of years. Robin Wall Kimmerer and Frank Kanawha Lake, “The Role of Indigenous Burning in Land Management,” Journal of Forestry, November 2001, pp. 36-41.